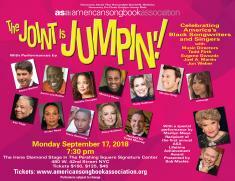 With Maurice Hines, Ken Page, Cady Huffman, Vivian Reed and More! www.americansongbookassoc..., are $150, $125 and $45. can indulge in dessert fare with beverages from the cash bar. New York, and co-chaired by Evelyn Jones Rich, prominent educator and civil rights activist. appreciate and embrace the historical and cultural importance of America's rich musical heritage. 7:30 PM. Tickets, available by going to www.americansongbookassoc..., are $150, $125 and $45. For further information, email info@americansongbookassociati... or call 347-387-4945.